and that you are not afraid of anyone, because a man’s rank means nothing to you. Tell us your opinion, then. Is it permissible to pay taxes to Caesar or not? They handed him a denarius and he said, ‘Whose head is this? Whose name?’ ‘Caesar’s’ they replied. My mother used always say – put things where they belong. Newspapers, food, the bicycle not in the hall etc etc. Jesus says the same here – give what belongs to where it belongs. So Jesus is being asked about taxes and politics and shifts things further. He knows he is being trapped about money. He moves on to higher questions. Something about the answer of Jesus – where do we belong? Belonging can sound heavy – as if we are being controlled. Or our money belongs to us and we can do what we like with it. But for Jesus – it’s the belonging of love. Not of power and control. It may feel like that – life and death, love, creation – many things are not in our control. We are born at God’s time and die the same. This reminds us that we are not the masters of our lives, We come from God and go to God. This belonging is the centre of our human family and community is that we are God’s. God doesn’t want to control us but to love us. But there’s a snag – belonging to God means belonging to each other. We have rights and duties of love. Give to others what belongs to others; give to the poor what belongs to the poor. Our work for hunger, education etc is not a charity for people; it is justice. Everyone has a right to the food of the earth and the food of the mind. It’s not charity when people are given food, education, a home, freedom of religion, freedom of speech – it is justice. 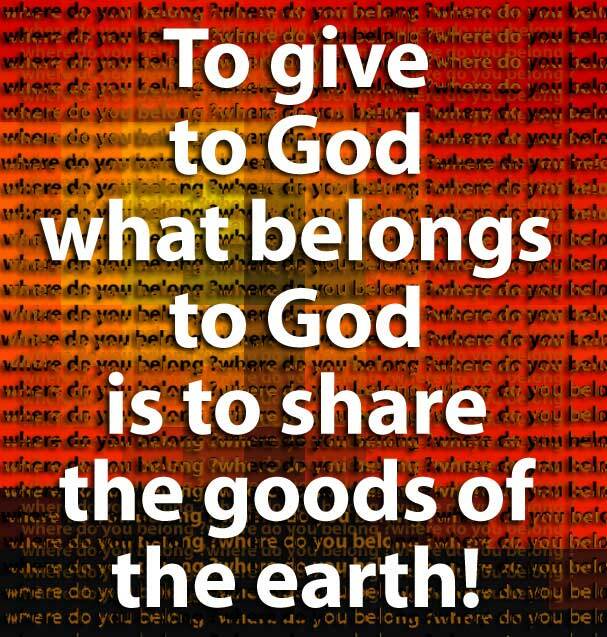 To give to God what belongs to God is to share the goods of the earth! Big statements which by and large only the christian faith makes. This entry was posted in Gospel of Matthew, Gospel Reflection, Liturgy Resources, Prayer Resources, Scripture and tagged Belonging, Donal Neary SJ, Gospel Reflection, Jesus, Justice, Love, Matthew 22:15-21, Sunday Gospel and Reflection for 19th October 2014, Sunday Scripture and Reflection for 28th Sunday Ordinary Time Year A, Sunday Scripture and Reflection for 29th Sunday Ordinary Time Year A, where do we belong.